Did you push your neck through that noose? Perhaps, we can loosen it up a bit! Ever since the Penguin and Panda updates by Google, many mcommerce and e commerce websites over the web have suffered from the penalties imposed by the search engine. After all, nothing can be 100% perfect and so is the case with websites. Well, we don’t make any tall claims that it is 100% possible to remove the google penalties. 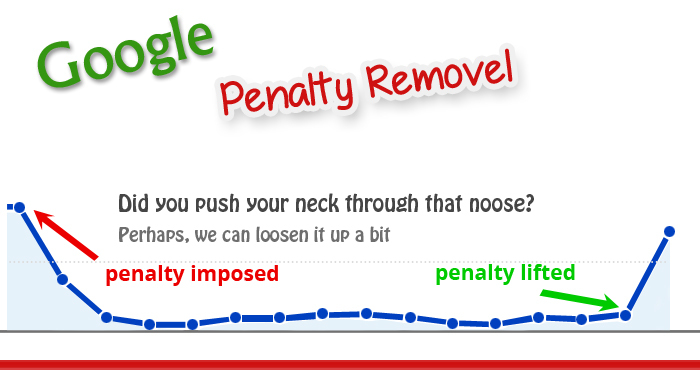 But with the Google Penalty Removal Services of MercuryMinds, there are fairly greater chances to get the penalties removed. With our planned approach, which includes a thorough audit and penalty assessment in the beginning and later on culminating in highly strategized methods for penalty removal, the chances for your site picking up and running the way it was before are high. First of all, we identify the issues with the site which have prompted Google to impose a penalty. Based on this, we strategize repair methods to get your site back to normal and overcome ranking drops as well. Correction of inorganic/ unnatural links. Correction of links based on Google Webmaster Tools link reports. Link correction using analysis by our own cutting edge technology. Providing course of action on how to submit links for reconsideration. Correcting all Google guidelines violations in the site. Reediting the contents to ensure high quality. Correcting contents in case of plagiarism. Checking and correcting other Penguin related issues like over optimization.